The limited edition Nike Women's Marathon LunarGlide+ 5 will be available for sale at Fleet Feet Menlo Park on Saturday, Oct. 12, starting at 10 a.m. This is a gorgeous, high demand shoe! 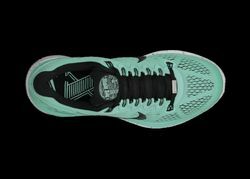 Same LunarGlide you love, in a special NWM color and with the Golden Gate Bridge logo on the tongue. Nice! It's only available at a few specialty running stores in northern California. We have a limited supply; see below for the size run. Fleet Feet Menlo Park will open for business at 10 a.m. on Saturday. We'll give those waiting in line a number starting at 9:30 a.m. and we'll take customers in order, to be fit one on one. Each customer will be given the opportunity to purchase their selected size before we move to the next in line. We're limiting sales of this shoe to one pair per customer. We cannot take holds or phone orders until Sunday. The limited edition Nike NWM 10th anniversary Flyknit Frees will go on sale at 10 a.m. on Thursday, Oct. 17. On Oct. 17, we'll give those waiting in line a number starting at 9:45 a.m. and we'll take customers in order, to be fit one on one. Each customer will be given the opportunity to purchase their selected size before we move to the next in line. We're limiting sales of this shoe to one pair per customer. We cannot take holds or phone orders until Friday, Oct. 18.